Haemodialysis, uraemic toxicity, fluid retention in kidney disease, transdermal technologies, minimally invasive diagnostics, interstitial pathophysiology, acute dialysis, intensive haemodialysis, haemodialysis in the haemodynamically compromised patient. Leonard gained his primary medical qualification at l’Université de Yaoundé in Cameroon in 2000. After working as a resident in Internal Medicine and Intensive Care at the CHU de Yaoundé, he moved to the UK to specialize in Nephrology. 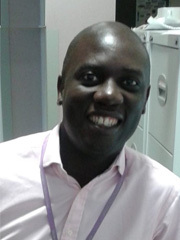 His specialist training started in 2006, after obtaining MRCP and completing Core medical Training at MRI and the UHSM. He holds a CCT in Nephrology. His research career took off effectively in 2008 when he joined the Renal Research team at MINT (Under the Supervision of Professor Brenchley and Dr Mitra) to carry out research into interstitial uraemic toxicity and fluid overload. He successfully completed his PhD entitled “Extraction and Analysis of Interstitial Fluid and Characterization of the Interstitial Compartment in Kidney Disease” in August 2012 at the University of Manchester. His research was recognized as outstanding and he won The Postgraduate Student of the Year Distinguished Awards Medal. He has also gained recognition nationally and internationally, winning prizes such as the Young Innovator Award at the American Society of Artificial Internal Organs and the European Renal Association Fellowship award. His work has led to patents, international collaborations and a spinout medical device company. Anuradha Jayanti, Milind Nikam, Leonard Ebah, Gill Dutton, Julie Morris, and Sandip Mitra. (2013). Technique survival in home haemodialysis: a composite success rate and its risk predictors in a prospective longitudinal cohort from a tertiary renal network programme. Nephrology Dialysis Transplantation 28(10):2612-2620. Leonard Ebah, Helge Wiig, Idalia Dawidowska, Charlotte O’Toole, Angela Summers, Milind Nikam, Anu Jayanti, Beatrice Coupes, Paul Brenchley and Sandip Mitra. (2013). Subcutaneous interstitial pressure and volume characteristics of renal impairment associated with edema. Kidney International 84: 980-988. Leonard Ebah, Mehvosh Akhtar, Ian Wilde, Graeme Hookway, Mark Vincent, Christopher Reeves, John Denton, John Woods and Sandip Mitra. (2012). Phosphate enrichment of dialysate for use in standard and extended haemodialysis. Blood Purification 34(1): 28-33. Leonard Ebah, Ian Read, Andrew Sayce, Jane Morgan, Christopher Chaloner, Paul Brenchley and Sandip Mitra. (2012). Reverse iontophoresis of urea in health and kidney disease: a potential diagnostic and monitoring tool? European Journal of Clinical Investigation 42(8): 840-847. Leonard Ebah, Beatrice Coupes, Paul Brenchley and Sandip Mitra. (2011). A modified in vivo flow variation technique for sampling uremic toxins in the subcutaneous interstitial compartment. Blood Purification 92(2): 96-103. Laurie Solomon, John Cheesbrough, Leonard Ebah, Tamer Al-Sayed, Michael heap, Nick Miliband, Dee Waterhouse, Sandip Mitra, Alan Curry, Rema Saxena, Rammohan Bhat, Michael Schulz and Peter Diggle. (2010). A randomised double-blind controlled trial of taurolodine citrate catheter locks for the prevention of bacteraemia in patients treated with hemodialysis. American Journal of Kidney Diseases 55(6): 1060-1068.